beyond making islands green and lush? Warm rainfall is that produced by "warm" clouds, which have tops below the freezing level, and do not contain any ice. In the subtropics and tropics the freezing level is located between 4 and 5 km, and warm clouds include stratocumulus clouds over the colder eastern ocean boundaries; shallow cumulus clouds that are more widespread throughout the subtropics and tropics; and congestus clouds, which tend to be confined over warmer ocean surfaces. That warm clouds can produce rain was quite an eccentricity in the earlier half of our last century, when it was believed that ice is necessary to produce rain. But field observations proved otherwise, and coalescence processes helped explain why clouds over oceans rain far more easily than those over land: oceans are naturally deprived of aerosol other than sea-salt and sulfate, which leads to low particle concentrations, relatively large cloud droplets, and hence more efficient auto-conversion and accretion. The CloudSat Cloud Profiling Radar (CPR), which is currently the only sensor capable of delineating warm cloud from drizzle and rain, shows that over most oceans there is more than 10% and up to 50% of warm cloud (see Figure below), and regardless of the region, between 20-40% of that warm cloud area contains precipitation. You might not be impressed by those numbers. But those who live on subtropical islands have long appreciated the occasional passing of warm rain showers, which on windward sides of hilly islands make for lush vegetation, even during the "dry" season when there is no deep convection. In a number of papers I have helped study how much warm clouds actually rain, as measured from ground-based radar, and how this compares to measures from passive sensors aboard satellites. I also contributed to a review paper as part of the ISSI workshop on Clouds, Circulation and Climate Sensitivity that speculates what the prevalence of warm rain might imply for larger-scales, and which reviews ongoing efforts in high-resolution modeling and observations of warm rain. Using a conceptual model of an overturning circulation, we show that by regulating the depth of convection, and thus the depth of the diffusive boundary layer in subsiding branches of a circulation, warm rain can influence the large-scale temperature gradients, and thus strength of the circulation. 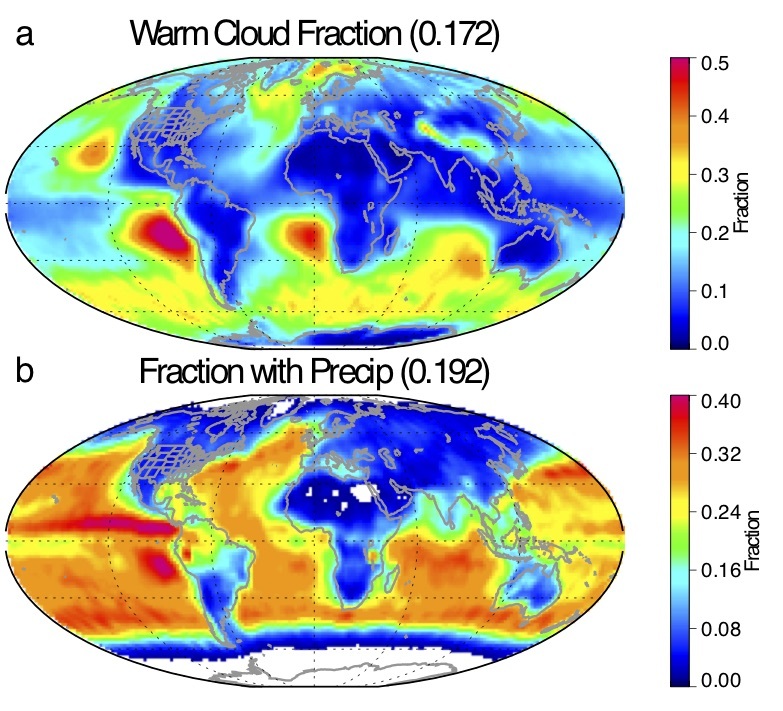 Below figure shows the global warm rain occurrence observed by CloudSat during 2007–2010. Warm clouds are as those clouds that have tops warmer than 0deg Celcius. These CloudSat data are processed using the 2C-PRECIP-COLUMN and 2C-RAIN-PROFILE algorithms described in Haynes et al. (2009) and Lebsock and L’Ecuyer (2011). Figure taken from Nuijens, Emanuel, Masunaga and L'Ecuyer (2017) [link].